Countries in South Asia already face considerable water management challenges: water resources are overexploited and depleting fast, and institutions are struggling to manage and allocate water effectively. Climate change will exacerbate existing problems through irregular rainfall patterns and increased incidence of floods and droughts. The Action on Climate Today (ACT) programme has been actively working in five South Asian countries (Afghanistan, Bangladesh, India, Nepal and Pakistan) to help governments plan for, and manage, the impacts of climate change in the water sector. 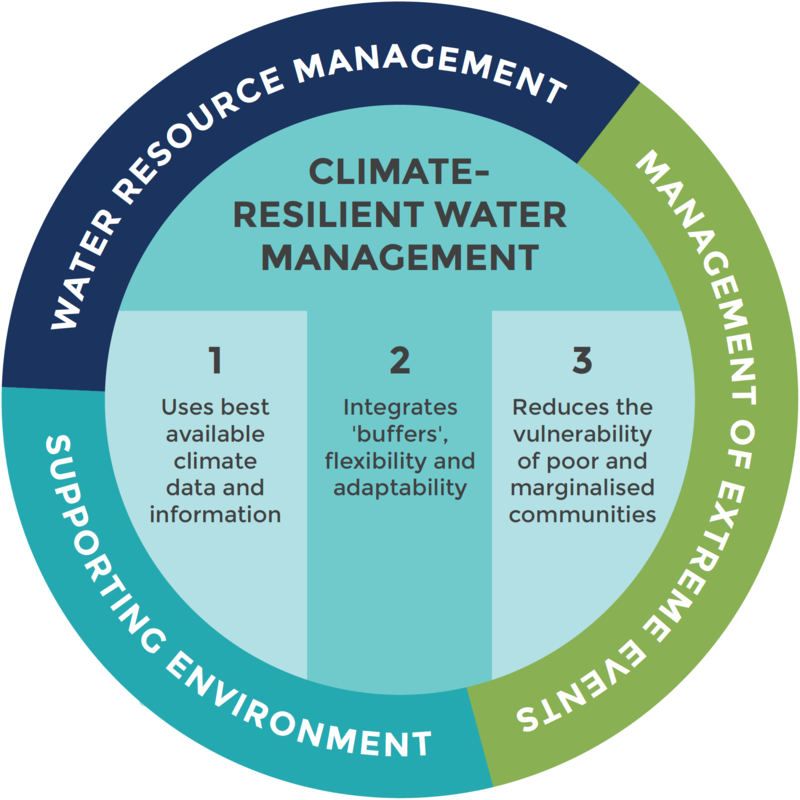 ACT has championed a Climate-Resilient Water Management (CRWM) approach as a way of increasing the resilience of water systems on which billions of people rely. This learning paper outlines the core elements of the CRWM framework and provides examples from ACT’s work employing the framework across the region. The methodology has been deployed in South Asia, but will be of relevance to practitioners and policy makers working in water resource management around the world. *Download the Learning Paper from the right-hand column. Climate change will increase water-stress in South Asia through irregular rainfall patterns and increased incidence of floods and droughts. This climate-driven water scarcity could reduce GDP growth rates in South Asia by as much as 6%. This conceptual framework for Climate Resilient Water Management (CRWM) clearly distinguishes CRWM from traditional approaches to water management. It highlights for the first time the practical considerations in operationalising a CRWM approach and has been successfully tested in South Asia. A sharp focus on reducing the vulnerability of poor and marginalised communities. Creating an enabling environment (through mainstreaming climate impacts in sectoral and cross-sectoral policies, among other governance instruments). Frame and communicate about climate change using language and concepts that are relatable and impacts that are tangible. Government officials are already aware of unseasonal, more intense and frequent, instances of drought, monsoon rains and floods, and urgently seek ways to address the impacts citizens face. This presents an opportunity and entry point to engage policy makers in the CRWM process. ACT (Action on Climate Today) is an initiative funded with UK aid from the UK government and managed by Oxford Policy Management (OPM). Since 2014 the Action on Climate Today (ACT) programme has been actively working in five South Asian countries – Afghanistan, Bangladesh, India, Nepal and Pakistan – to help national and sub-national governments plan for, and manage, the impacts of climate change in the water sector. The ACT programme has championed a Climate-Resilient Water Management (CRWM) approach as a way of increasing the resilience of water systems on which billions of people rely. The programme’s activities in this domain range from preparing urban flood management plans and adapting agriculture to increasing incidences to drought, to mainstreaming climate adaptation in water policies and estimating the future demand for water under different climate scenarios.